Here is a basic, yummy recipe that made a delicious side dish. For the “noodles,” just julienne or thinly slice zucchini into noodle-like strings. Steam them for a few minutes – until soft – then set aside. Bring a large pot of homemade, seasoned vegetable broth to a boil, then reduce to a simmer. Saute onion and garlic in coconut oil in a saucepan for 5 minutes. Add tomatoes (I prefer Roma) to the saucepan. Cook for a few minutes. Add 4 cups of spinach to the saucepan. Wilt briefly and add vegetables to the pot. 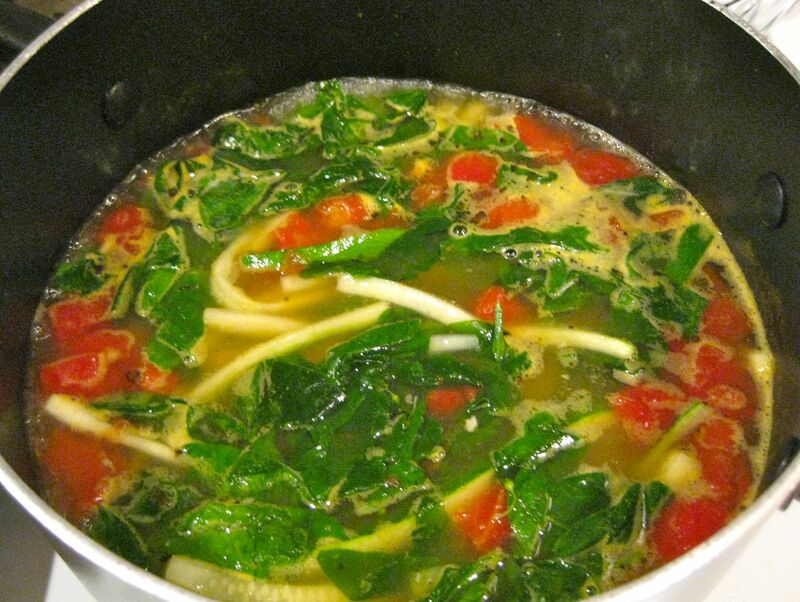 Add zucchini “noodles” and allow to simmer for a few minutes. Remove from heat and serve. It looks absolutely delicious. Are those really zucchini noodles? They look “real”.